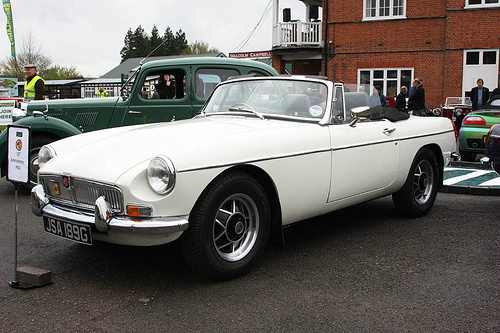 The MGB Mark 2 sports car was introduced in 1967. Up to that date, there had been sufficient changes to the car to warrant the creation of a Mark 2 version. When originally launched in 1962, it was available only as a convertible. However, a few months later, a detachable works hardtop, made from fibreglass, was made available. Furthermore, in 1965, a fixed head coupe version was launched, which turned the MGB into a practical, and very stylish three door hatchback. The new gearbox required major changes to the floor pan, whilst the shape of the transmission tunnel was altered so that it had a flat top. During this period, US safety regulations had been furthered strengthened. This required MGB convertibles, exported to the US, to have the number of windscreen wipers increased from two to three to ensure that the entire windscreen was duly swept. Another US safety requirement was for the dashboard to receive a plastic and foam rubber cover, which would allow it to be designated as a safety dashboard. On the other hand, non US cars would retain the existing steel dashboard. In 1969, the original wheels, made of pressed steel, were changed to include the five stud Rubery Owen Rostyle version. Also, wire wheels became an optional extra. A new front grille was added which was recessed, painted black and made of aluminium, unlike the original chromed version. Collapsible steering wheels were introduced on UK cars. In terms of performance, apart from a small reduction in bhp, there was no difference between the Mark 2 and the original 1962 model. A 1967-71 MGB Mk 2, in average condition, would fetch around £2,500/$4,000, whilst an example in very good condition would command anything between £5,000/$8,000 and £8,000/$13,000.